Podio - A very underused and sometimes misused internet term, describing the modern form of the Audio Drama. Think of the olden days before television, when families would listen to radio dramas like Orson Welles' take on 'The War of the Worlds' and serials like 'The Lone Ranger'. Many people use the term in conjunction with PodioBooks, PodioDramas, or most commonly Podcasts; a medium of audio recorded content that can be downloaded and listened to via PC/MAC and most mobile electronic devices. Today I'll be reviewing the first two seasons of 'We're Alive - A Story of Survival'. I would have honestly reviewed the seasons individually but my "blogger's math" tells me the laziness factor + the urges of the entirety of season 2 just a click away was too great for me to handle = this review after the jump... and I'm totally coining blogger's math. I feel that a zombie's presence in today's media is relatively mainstream. With all the major motion pictures released recently and more to come (World War Z) not including novels, television, and of course comic books... they're everywhere! Not as much as their undead cousin vampires but hey... rotten-ness doesn't sparkle. Wrong demographic anyhow. Some believe there is a bit of an over-saturation of the flesh-eatery genre and since I'm a lover of horror, that kind of negative mindset is sacrilege and it won't be tolerated! There can never be enough of anything as long as you can bring something new to the table. I always say... show (or in this case tell) me something I've never seen or heard before and that time spent becomes a warranted moment of awesome. 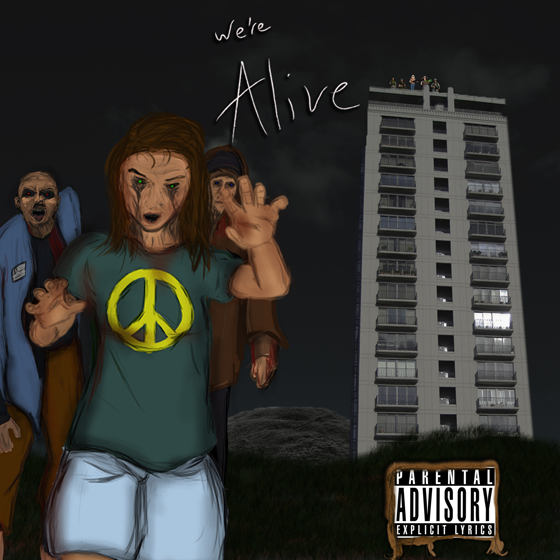 And that's why I'm going to share my mostly non-spoilery thoughts on We're Alive; a serialized audio drama about several people trying to survive during a zombie apocalypse. With all the trials and tribulations that come with the fall of what seems to be most of humanity, there is a greater story to tell here. Just to give the broader audience something to compare to, think of "The Walking Dead". More so the book than the show because 'Alive' is all about alteration, adaption, characterization, and development. Everything including situations, environments, and character's personalities constantly change. The co-creators Kc Weyland & Shane Salk offer a different approach to grasping the depth and skills needed to survive the undead wasteland. In all honesty, a typical shopkeeper with minimal survivalist knowledge won't be able to last too long unless he has a couple friends. In the case of 'Alive', we're introduced to three soldiers; Michael, Angel, and Saul. In which it's pretty easy to understand why these guys might make it through all this. Given their abilities along with the a few other survivors, they blockade themselves inside a downtown apartment building. As time passes, they find out some things I consider pretty brilliant from a creative standpoint. Not just with their collective knowledge on how to retrofit a somewhat broken building into a stable environment but... with the flesh eaters themselves. I'm a Romero slow-moving zombie fan. Die hard even. I argue about how fast-moving zombies makes absolutely no sense, 28 Days Later was about a 'rage virus' and not the living dead, and how people shouldn't recognize Resident Evil as a film series. Only 90 minute episodes from which you've blanked completely out from existence and couldn't recall anything but maybe a shot of Milla's tahs. And I've digressed. What We're Alive does so well is establish a kind of zombie which I think Romero himself could get behind. Lets take some elements of the games Dead Nation and/or Left 4 Dead and make them practical. Instead of just strength in numbers, lets create stakes... something different. Something to fear. Even with all the prior zombie-fied information you carry into this podio... you can't predict what's coming because kids; this isn't your Romero zombie. Well I've clued you in on what sticks out to me... but you might wondering what is there to look forward to in a podio? 'We're Alive' releases their episodes by parts to a chapter on a weekly basis. Usually three 20-30 minute parts to a single chapter and then they go on a two week break. Releases were hard on me at first due to how short they are but it's actually that much easier to follow being that bite sized. I personally just wait until an entire chapter is out there and binge for an hour or so. I feel the acting grows on you after the first few episodes. I mean no one is perfect but the main characters are convincing enough that it never takes you out of it. It's pretty solid overall and reaches it's peak towards the end of the first season. One of the best parts about the show is it's ability to keep you intrigued with the use of clever banter and timing. I'm not sure but it feels like they record each heavily exchanged dialogue in real-time and if not... they have an incredible editor as well. The story always felt like it was moving forward... some chapters (mainly around the end of season 1 and the beginning of season 2) kinda hung a little longer than I would have liked but without them, everything would have felt a little lost. Other than that... I have to applaud whoever has the knowledge, skill set, or had done the research for all the military background, mechanical detailing, and so forth within the show. That delivers a sense of reality that other popular movies lose. Everything sound-wise is just fine. All improves in time even though it didn't need to. But I can tell going back and listening to a few older episodes. All there is left to mention is that there is a creepy call that some of the zombies make and even though it's so signature to the show at this point... it still gives me chills. The same kind of feeling Silent Hill used to give me once that alarm sounded off. At this point, you know I dig the show. Why would I have sat this long listening to well over 25 hours worth of content to tell you it's a stinker? I wouldn't, and it's not. If I were to ever get a podio off the ground, this is the way I want to go. Right now they're on Chapter 29 and I suggest if you have a iPod, Zune, or MP3 player... and love zombies.. you should try to get in on this as soon as possible. OK, just now realized I didn't necessarily review the seasons themselves because I didn't want to get into spoilers. Things happen and characters die. I refused to take those plotted moments away. So go check it out and we'll talk about it! If you would like to check out We're Alive for yourself... just head over to http://www.zombiepodcast.com/The_Zombie_Podcast/Main.html and like them on their Facebook page. Episodes are free to download from iTunes, Zune, and streaming from their site. If you're slowly becoming a super fan like myself... they also offer retail versions of Season 1 & Season 2 on CD where they've cleaned up some of the audio and removed any ads.